In years long gone, too many for the almanac to tell of, or for clocks and watches to measure, millions of good fairies came down from the sun and went into the earth. There, they changed themselves into roots and leaves and became trees. There were many kinds of these, as they covered the earth, but the pine and birch, ash and oak, were the chief ones that made Holland. The fairies that lived in the trees bore the name of Moss Maidens, or Tree “Trintjes,” which is the Dutch pet name for Kate, or Katharine. The oak was the favorite tree, for people lived then on acorns, which they ate roasted, boiled or mashed, or made into meal, from which something like bread was kneaded and baked. With an oak bark, men tanned hides and made leather, and, from its timber, boats, and houses. Under its branches, near the trunk, people laid their sick, hoping for help from the gods. Beneath the oak boughs, also, warriors took oaths to be faithful to their lords, women made promises, or wives joined hand in hand around its girth, hoping to have beautiful children. Up among its leafy branches, the new babies lay, before they were found in the cradle by the other children. To make a young child grow up to be strong and healthy, mothers drew them through a split sapling or young tree. Even more wonderful, as medicine for the country itself, the oak had the power to heal. The new land sometimes suffered from a disease called the (or fall). When sick with the, the ground sunk. Then people, houses, churches, barns, and cattle all went down, out of sight, and were lost forever, in a flood of water. But the oak, with its mighty roots, held the soil firm. Stories of dead cities, that had tumbled beneath the waves, and of the famous Forest of Reeds, covering a hundred villages, which disappeared in one night, were known only too well. Under the birch tree, lovers met to plight their vows, and on its smooth bark was often cut the figure of two hearts joined in one. In summer, the forest furnished shade, and in winter warmth from the fire. In the springtime, the new leaves were a wonder, and in autumn the pigs grew fat on the mast, or the acorns, that had dropped on the ground. So, for thousands of years, when men made their home in the forest and wanted nothing else, the trees were sacred. But by and by, when cows came into the land and sheep and horses multiplied, the more open ground was needed for pasture, grain fields, and meadows. Fruit trees, bearing apples and pears, peaches and cherries, were planted, and grass, wheat, rye, and barley were grown. Then, instead of the dark woods, men liked to have their gardens and orchards open to the sunlight. Still, the people were very rude, and all they had on their bare feet were rough bits of hard leather, tied on through their toes; though most of them went barefooted. The forests had to be cut down. Men were so busy with the ax, that in a few years, the Wood Land was gone. Then the new “Holland,” with its people and red-roofed houses, with its chimneys and windmills, and dikes and storks, took the place of the old Holt Land of many trees. Now there was a good man, a carpenter and very skillful with his tools, who so loved the oak that he gave himself, and his children after him, the name of Eyck, which is pronounced Ike and is Dutch for oak. When, before his neighbors and friends, according to the beautiful Dutch custom, he called his youngest born child, to lay the corner-stone of his new house, he bestowed upon her, before them all, the name of Neeltje (or Nellie) Van Eyck. The carpenter daddy continued to mourn the loss of the forests. He even shed tears, fearing lest, by and by, there should not one oak tree be left in the country. Moreover, he was frightened at the thought that the new land, made by pushing back the ocean and building dikes, might sink down again and go back to the fishes. In such a case, all the people, the babies and their mothers, men, women, horses, and cattle, would be drowned. The Dutch folks were a little too fast, he thought, in winning their acres from the sea. One day, while sitting on his door-step, brooding sorrowfully, a Moss Maiden and a Tree Elf appeared, skipping along, hand in hand. They came up to him and told him that his ancestral oak had a message for him. Then they laughed and ran away. Van Eyck, which was now the man’s full family name, went into the forest and stood under the grand old oak tree, which his fathers loved, and which he would allow none to cut down. “I cannot see how all these things can be,” said Van Eyck. The leaves of the branch rustled for another moment. Then, all was still, until the Moss Maiden and Trintje, the Tree Elf, again, hand in hand, as they tripped along merrily, appeared to him. “We shall help you and get our friends, the elves, to do the same. Now, do you take some oak wood and saw off two pieces, each a foot long. See that they are well dried. Then set them on the kitchen table to-night, when you go to bed.” After saying this, and looking at each other and laughing, just as girls do, they disappeared. Pondering on what all this might mean, Van Eyck went to his wood-shed and sawed off the oak timber. At night, after his wife had cleared off the supper table, he laid the foot-long pieces in their place. When Van Eyck woke up in the morning, he recalled his dream, and, before he was dressed, hurried to the kitchen. There, on the table, lay a pair of neatly made wooden shoes. Not a sign of tools or shavings could be seen, but the clean wood and pleasant odor made him glad. When he glanced again at the wooden shoes, he found them perfectly smooth, both inside and out. They had heels at the bottom and were nicely pointed at the toes, and, altogether, were very inviting to the foot. He tried them on and found that they fitted him exactly. He tried to walk on the kitchen floor, which his wife kept scrubbed and polished, and then sprinkled with clean white sand, with broomstick ripples scored in the layers, but for Van Eyck, it was like walking on ice. After slipping and balancing himself, as if on a tightrope, and nearly breaking his nose against the wall, he took off the wooden shoes, and kept them off, while inside the house. However, when he went outdoors, he found his new shoes very light, pleasant to the feet and easy to walk in. It was not so much like trying to skate, as it had been in the kitchen. At night, in his dreams, he saw two elves come through the window into the kitchen. One, a kabouter, dark and ugly, had a box of tools. The other, a light-faced elf, seemed to be the guide. The kabouter at once got out his saw, hatchet, auger, long, chisel-like knife, and smoothing plane. At first, the two elves seemed to be quarreling, as to who should be boss. Then they settled down quietly to work. The kabouter took the wood and shaped it on the outside. Then he hollowed out, from inside of it, a pair of shoes, which the elf smoothed and polished. Then one elf put his little feet in them and tried to dance, but he only slipped on the smooth floor and flattened his nose, but the other fellow pulled the nose straight again, so it was all right. They waltzed together upon the wooden shoes, then took them off, jumped out the window, and ran away. When Van Eyck put the wooden shoes on, he found that out in the fields, in the mud, and on the soft soil, and in sloppy places, this sort of footgear was just the thing. They did not sink in the mud and the man’s feet were comfortable, even after hours of labor. They did not “draw” his feet, and they kept out the water far better than leather possibly could. When the Van Eyck vrouw and the children saw how happy Daddy was, they each one wanted a pair. Then they asked him what he called them. “Klompen,” said he, in good Dutch, and klompen, or klomps, they are to this day. 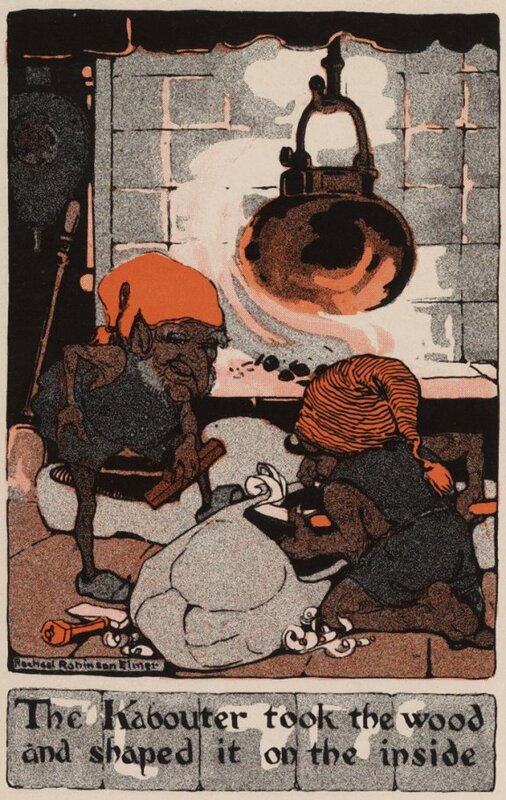 So, going out to the blacksmith’s shop, in the village, he had the man who pounded iron fashion for him on his anvil, a set of tools, exactly like those used by the kabouter and the elf, which he had seen in his dream. Then he hung out a sign, marked “Wooden blocks for shoes.” He made klomps for the little folks just out of the nursery, for boys and girls, for grown men and women, and for all who walked out-of-doors, in the street or on the fields. Soon klomps came to be the fashion in all the country places. It was good manners, when you went into a house, to take off your wooden shoes and leave them at the door. Even in the towns and cities, ladies wore wooden slippers, especially when walking or working in the garden. Klomps also set the fashion for soft, warm socks, and stockings made from sheep’s wool. Soon, a thousand needles were clicking, to put a soft cushion between one’s soles and toes and the wood. Women knitted, even while they walked to the market, or gossiped on the streets. The Klomp-Winkels, or shops of the shoe carpenters, were seen in every village. Then Van Eyck told his dream. It was this: The Moss Maiden and Trintje, the wood elf, came to him again at night and danced. They were lively and happy. “What now?” asked the dreamer, smilingly, of his two visitors. He had hardly got the question out of his mouth when in walked a kabouter, all smutty with blacksmith work. In one hand, he grasped his toolbox. In the other, he held a curious looking machine. It was a big lump of iron, set in a frame, with ropes to pull it up and let it fall down with a thump. “What is it?” asked Van Eyck. “It’s a Hey” (a pile driver), said the kabouter, showing him how to use it. “When men say to you, on the street, to-morrow, ‘How do you sail?’ laugh at them,” said the Moss Maiden, herself laughing. By this time, Van Eyck had asked so many questions, and kept the elves so long, that the Moss Maiden peeped anxiously through the window. Seeing the day breaking, she and Trintje and the kabouter flew away, so as not to be petrified by the sunrise. “I’ll make another fortune out of this, also,” said the happy man, who, next morning, was saluted as Mynheer Blyd-schap (Mr. Joyful). At once, Van Eyck set up a factory for making pile drivers. Sending men into the woods, who chose the tall, straight trees, he had their branches cut off. Then he sharpened the trunks at one end, and these were driven, by the piledriver, down, far and deep, into the ground. So a foundation, as good as stone, was made in the soft and spongy soil, and well-built houses uprose by the thousands. Even the lofty walls of churches stood firm. The spires were unshaken in the storm. Old Holland had not fertile soil like France, or vast flocks of sheep, producing wool, like England, or armies of weavers, as in the Belgic lands. Yet, soon there rose large cities, with splendid mansions and town halls. As high towards heaven as the cathedrals and towers in other lands, which had a rock for the foundation, her brick churches rose in the air. On top of the forest trees, driven deep into the sand and clay, dams and dikes were built, that kept out the ocean. So, instead of the old two thousand square miles, there were, in the realm, in the course of years, twelve thousand, rich in green fields and cattle. Then, for all the boys and girls that travel in this land of quaint customs, Holland was a delight.